ENDOR™ moisturising cream is hydrating, gentle on the skin and is easily absorbed into the skin. It contains high concentrations of Glycerin, Emu Oil, Jojoba Oil, Hyaluronic acid, Vitamin E, MSM and Co Enzyme Q10. It is suitable for all skin types, but particularly effective on damaged skin, such as Eczema, Psoriasis, Rosacea. It leaves the skin soothed, soft and hydrated. To be used in conjunction with ENDOR™ products for managing your skin condition. 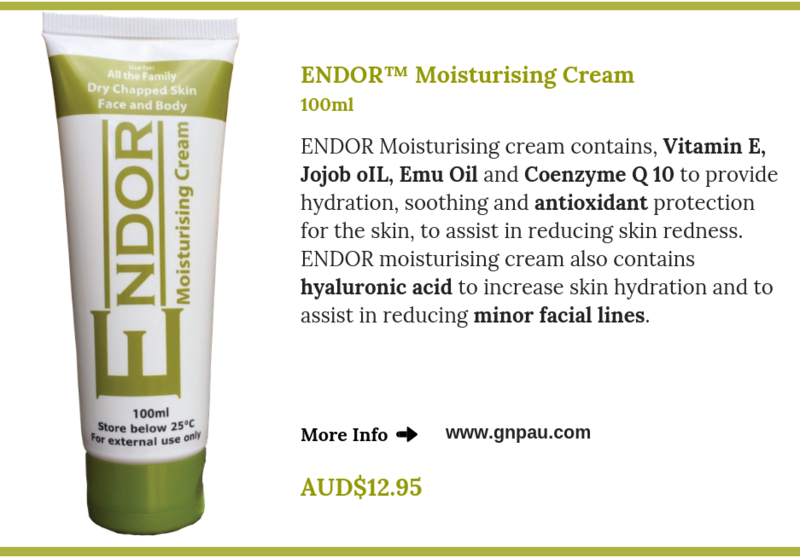 ENDOR™ Moisturising cream is an all over body moisturiser. It is gentle for use on babies, children and the rest of the family. Place desired amount on the palm of your hand and gently rub into the skin. Apply as regularly and as much as required. To read our FAQ about ENDOR™ Moisturising cream, please click here. Aqua, Glycerine, Cetyl Alcohol Stearth 21, Emu Oil Isopropyl Myristate, Jojoba Oil, Hyaluronic acid, Vitamin E, Silicone Fluid, Microcare, Sodium Citrate, MethylSulfonyl Methane, D-Panthenol, Vitamin C, Co Enzyme Q10.